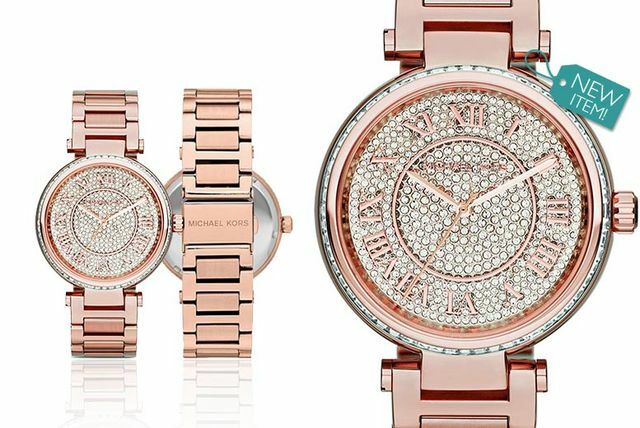 Perfect for the well-to-do lady who loves a bit of attention, this Michael Kors MK5868 watch has a quite breathtaking centrepiece dial which features multiple concentric circles of glittering white crystals, complemented by an elegant rose gold-tone case and strap. Get a Michael Kors MK5868 Skylar watch. With a stunning rose gold case and strap. A dial encrusted with hundreds of crystals. And a fold-over clasp with push button. Powered by precision quartz movement. Sophistication for the discerning woman! Automatic or self winding watches use arm motion to wind the watch’s mainspring, making manual winding unnecessary. Watch winders can also wind an automatic watch. Automatic watches are still the most popular watches among watch enthusiasts. Some of the best quartz and automatic chronograph watches for men and women: The chronograph function on chrono watch dials lets you time races and events. Chronographs are one of the most popular watch types on the market today. Military divers were successful, but diving watches were really popularized by Jacques Cousteau in his film Le monde du silence. Dive watches are water resistant to at least 333 feet and come with a unidirectional rotating bezel, popular with scuba divers. Fashion watches are accessories that make a statement about the wearer. These are some of the best fashion watches and most popular fashion watch brands, including many affordable new fashion watches for women and men. Inspired by Italy’s fashion-forward culture and rich history, Italian design watches are shaping the present and future of the watch industry. Many Italian design watches are Swiss made and combine top design with first-rate technology. Large watches are in. Now that this type of wristwatch has become a fashion statement, its size has become just as important as its color, style, and materials. Large watches are popular watches for both men and women. About Swiss luxury watches and many affordable luxury watches for men and women: Luxury watches are more than timepieces; a luxury watch is a work of art with fine movements doing superb things with gold, diamonds, springs and tiny gears. New mechanical watches appear every year at Baselworld. We carry the best affordable mechanical watches including hand wind and self winding automatic mechanical watches for men and women with some of the most popular complications. Some of the best military style watches for men. Military watches are relatively new but play an important role in wrist watch history. The first exclusively military watch appeared in the late 1800’s. Orange, a trendy color in both fashion and watches, is definitely having its moment this season. Choose your favorite orange watch from the many popular watch styles and options available. Gracing the wrist of pilots, these aviation timepieces have reached the apex of the ideal fusion of style and durability. From the Fortis Aviatis collection to squadron watches, pilot watches are tough and ready for anything. Surprisingly, the first quartz watches were ultra-luxury items and were far more expensive than comparable mechanical watches. We offer some of the best quartz watches for men and women, including Swiss and Japanese quartz watches. Worn by astronauts in outer space, these durable timepieces are a testament to man’s achievements in space. Learn about the Swiss contribution to space travel and the space watches that made the journey. Sports watches aren’t just timing races; they’re setting new trends, as well. The popularity of oversized watches derives largely from sports watches. Many sport watches incorporate functions like heart rate monitors and GPS tracking. Best Swiss watches and watch brands for men and women: Swiss made wrist watches are highly desirable, and the Swiss watch industry is stronger than ever. Making a comeback, the two-tone watch trend is becoming more and more popular and watch brands are eager to include two-tone variations in their timepiece collections. You want to buy a watch. But, you have no idea where to start. What style is best for what formality? What if you want to take a watch hiking? Or diving? How do you know if it fits? The point is, there is an overload of information to know about watches before making the right purchasing decisions. These all lead to that terrible feeling…Buyer’s remorse. While this article will cover the top 5 styles every man should know. The sole function of the dress watch is to compliment a business suit or formal wear. Dress watches aren’t even that concerned with accurate timekeeping, as many don’t even have second hands. So what are the important features to look for then? Put simply, simplicity. Practically speaking, a dress watch should be properly proportioned to the wearer’s wrist. Otherwise, it will draw attention to itself; the one thing a dress watch should never do. Since it is worn with a suit, a dress watch must be thin enough to slip in and out of a dress shirt cuff easily. The standard rules of matching metals and leathers with shoes and belts apply as well. After taking these considerations into account, the next most important detail for a dress watch is simplicity. Most dress watches have no complications, or have at most a second hand and a date window. The presentation must be simple as well. Metal sabre style hour indexes are common, as are roman numerals. Arabic numerals may be used but should be small. The dial and bezel should be unornamented, or patterned subtly at most. White, black or metallic faces are preferred. Imagine a battlefield at the break of dawn. The artillery bombardment goes on for precisely eight minutes. Almost before the last round hits, the infantry assault has begun while the cavalry regiment charges the enemy flank nearly simultaneously. This was what warfare looked like at the turn of the twentieth century. And it was made possible because of the wristwatch. What Makes a Field Watch? First and foremost, field watches must be rugged. Traditionally, a good field watch would have a stainless steel case though modern versions may feature PVD coatings or titanium construction. A field watch must be readable, even under low-light or night conditions. As such, it will have a high-contrast black dial with white numbering. The polished gold hour markers that are common on more formal watches can be slow to read in the field and can create undesirable glare under sunlight. The bands on field watches were traditionally canvas or leather, since they could easily be swapped out if damaged. While metal link bracelets would seem to be the most durable, they are easily scratched and costlier to replace. There isn’t any one style that defines an aviator watch. In keeping with the forward-thinking nature of the aviation industry, the type has grown and developed as new technology and new requirements have emerged. The earliest watches worn by pilots were repurposed field watches. They had to be accurate, of course, and they had to be readable under low-light conditions. Field watches, with their hand-wound movements and black dials with large white numerals, satisfied both of these requirements. Over time, air forces around the world began to develop watches with specific aviation functions. In the 1930s, the Luftwaffe developed the Flieger style of watches: The Type-A with simple numerals and delta index at 12 o’clock, and the Type-B with large minutes in the outer dial and hours in the inner dial. The dive watch is one of the most prolific men’s watch styles. It should be obvious that accurate timekeeping is crucial when hundreds of feet underwater while carrying a finite supply of air. As a result, divers have always demanded superior timepieces. Modern scuba didn’t really exist until the 1950s, right around the time, Ian Fleming started writing the James Bond novels. Fleming wrote the novels every summer while vacationing at his home in Jamaica, where he was an avid diver. This was the same time that Rolex introduced the Submariner and so Bond, diving and Rolex have been linked ever since. What Makes a Good Dive Watch? In addition to accuracy, a dive watch must also possess superior water resistance. A true diver will conform to the ISO 6425 standard, a series of tests designed to ensure resistance to at least 100 meters though many will offer even greater resistance. Case and band material must be corrosion resistant, so stainless steel, titanium, silicone and rubber are often used. Bands are typically longer than usual in order to fit over bulky dive equipment. While sapphire is often the desired watch crystal material, divers may prefer hardened mineral glass. Even though it scratches more easily than sapphire, it is more resistant to breakage, which can be catastrophic when deep underwater. Racing watches, not being bound by uniformity, tend to be much flashier. You’ll have far more exotic color and style options when selecting a racing watch than say, a field watch. Just remember that the flashier the watch, the more casual it becomes and dress accordingly. There are two features which define a good race watch. A chronograph and a tachymeter. A chronograph is a watch with a separate stopwatch function, usually featuring an extra sub-dial (or three) and pushers at the 2 and 4 o’clock positions to start/stop and reset the second hand. A tachymeter is a type of bezel used to make time and distance calculations. By measuring the number of seconds to travel a known distance, the outer markings will show speed in the unit measured per hour. Try this example: If you started timing at zero seconds and went a mile in 30 seconds, you would look down and see 120 at the 6 o’clock (or 30 seconds) position on the bezel. The watch is telling you that your speed is 120 miles per hour. It doesn’t matter what unit of measure you use; the tachymeter still reads units per hour. Obviously, that can be useful to a racer calculating laps per hour at a track. This questions I hear a lot from friends and people who are planing to buy a watch. That’s why I decided to write an article that will help you to make a right watch choice. For the majority of men, a watch is one of the few pieces of jewelry that they will wear. So it is very important to choose a right watch that would be of utmost importance to man’s image. Let’s start. Watches have a wide range of characteristics depending on internal or external features. For better understanding we propose to turn to some tables below. What is Important when Choosing watches? Breitling, Omega, Rolex, IWC etc. – thick markings and hands with lots of tritium. – nearly always have thick, luminous hands and markings. Diver are inspired by the Rolex Submariner. Pilot are inspired by the IWC Mark XV (or earlier). Learn some facts about the watch manufacturer reputation yourself but not asking watch-store sales people in most cases they are staggeringly ignorant. Ask your friends or relatives who already own the brands of watches you are interested in. 100 meters deep water resistant will save your watches if they are worn during a workout or if you are caught in a rainstorm. Stainless-steel will last longer then leather. Plus, it can easily be worn with a business suit but can be paired just as easily well as with casual dress. The life of mechanical watches can be almost infinite. Quartz watches parts often cannot be repaired, but must instead be replaced. The life of a quartz watch can certainly be limited by the availability of those parts. What is NOT important when choose a watches? Really, actual mechanism inside the watch that makes them “move” is seldom particularly important if you are not buying watches over $10,000 or has some unique functions. very few watches under $20,000 are hand crafted in a quaint village in the Swiss Alps. These were our watch choosing tips for your confidence in the watch shop. Now you can easily determine calendar watch from chronograph and explain the difference between quartz watch and mechanical and their prices as well as learn important and less important moment in watch choosing. We hope that with that useful information you could find right watches, perfectly fitting your style and … hand size. There are many different watches in the market. Find one that fits your style. These are 8 steps to choose a nice watch. 1. Decide what kind of watch you want. Do you want a metal band? Rubber? Polyurethane? 3. Determine your price range. 4. Be sure that the watch can actually tell time. In other words, get one that has quartz or mechanical movement. The first uses a battery and a vibrating crystal while the latter one uses a wound spring and a gear system. Some watches have a movement that is charged by the movement of the wrist, this will keep the watch wound or charged indefinitely whilst you wear it. Seiko has quartz movements that do this called “Kinetic” and mechanical movements that do this are called “Automatic” . 5. Styling may be very important. For example if you want a sophisticated, sleek look you might want to find a sleek, thin, long silver watch. For more of the punk/rock star look, you could get one with a very wide webbing or leather band. For the classy, preppy look, a metal analog watch would be nice. 6. Get a watch that is durable. You can’t really tell by looking at one, but you can check its ratings by the manufacturer. Rolex, Tag Heuer, Rado, and other well known brands are very well made. Check the manufacturer to make sure they have a reputation of good watches, if expensive. At the lower price range some good manufacturers are Seiko, Casio, Swatch, Timex, and Orient. 7. Check for water resistance. Unless you see a marking for meters (ex. 30 meters, 100 meter, etc…) assume that it cannot be worn in water. 8. If you are worried about battery life, go for digital watches, some CASIO models claim for 10 years of battery life. ⇒ If the watch which you are going purchase for everyday use and cheaper ones ($20-$50), then go for such a watch for which you yourself can change batteries. This would save a lot of dollars for getting battery replaced. ⇒ Purchase a watch with standard sized strap (10, 12, 14, 16, 20, 22 mm) as they are easily available everywhere. If the strap is too wide like 35 mm, then such straps are hard to get and are much too expensive. ⇒ For the average person, a Seiko, G-Shock, Swatch, or Casio are all great values. ⇒ Stay within price range. Watches are easy to lose, and your investment might just go out the window. ⇒ Beware of counterfeit brand name watches. If it seems too cheap to be real, it probably is a fake. ⇒ Many reputed Swiss Made watches should be bought from their official dealers. Buying Swiss watches online may be risky. ⇒ Never try to open a watch yourself. Always take it to a certified jeweler. ⇒ Don’t buy an analog watch without markings unless you are able to read it.